Every major presidential candidate in both the Republican and Democratic parties supports letting states legalize marijuana for the first time in American history. With Sen. Marco Rubio’s dropping out, there are no contenders left in the race who have pledged to enforce federal marijuana laws in states that opt to end prohibition. Clinton, Sanders, Trump, Cruz and Kasich all say they will support state legalization of Marijuana. Looks like the politicians have seen the polls showing that people overwhelmingly support legalization and now are using it to get votes. Whatever has made them change their mind doesn’t matter though, as long as they follow through! Soon we will be doing marijuana delivery in every state! Check out the Budly Marijuana delivery app! 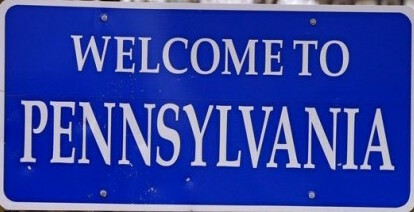 Could Pennsylvania be the next state to legalize medical cannabis? Last Wednesday the Pennsylvania House of Representatives went ahead with a bill by a 149-43 vote that if enacted into law would allow medical doctors in the state to prescribe marijuana creams, gels, oils, ointments and pills, as well as cannabis in liquid form. Although the Senate passed a previous version of the legislation by a 40-7 vote last May, it has since then been amended to limit the qualifying conditions. Democratic Gov Tom Wolf said that if the measure reaches the governor’s office he would sign it into law. Wolf has long been supporter of legalizing medical cannabis and before the House voted, the governor encouraged lawmakers to approve the bill. “It is time to legalize medical marijuana because we should not deny doctor-recommended treatment that could help people suffering from seizures or cancer patients affected by chemotherapy,” “I urge quick action by the Legislature to legalize medical marijuana” he said last Tuesday. The list of ailments that medical practitioners will be able to prescribe marijuana for include conditions such as AIDS, cancer, epilepsy, glaucoma and multiple sclerosis, as well as chronic or intractable pain. It would also allow the state to regulate cannabis dispensaries and growing facilities. This initiative would make Pennsylvania the 24th to legalized medical marijuana with another 10 states on the ballot for 2016. It’s no surprise that the legal weed business is blooming (no pun intended). Marijuana Business Daily recently published its annual report on the U.S. cannabis industry and predicts up to $44 billion in economic impact by 2020. They have been producing this publication since 2012 and they predicted $14 billion to $17 billion in impact for 2016. This very comprehensive report accounts for all the fringe benefits the industry produces from light manufacturers, grow properties and transport, just to name a few. Their rough estimate is that for every dollar spent directly on the marijuana economy that it adds $3 for all the support services. All this positive economic impact though hinges on many varying factors and most notably the next federal election. While most Republican leaders mostly oppose the legal cannabis industry, front runner Donald Trump though commenting about his pro stance to medical marijuana, there is still potential to see all this progress come to a screeching halt. With the momentum on the side of legalization, 24 states and DC now having legal cannabis industry, things are looking good. More regulation will bring more certainty and more safety. President Obama has given financial institutions the go ahead to start accepting deposits from the legal weed industry. As the industry moves forward the financial benefit to the country will be huge and we look forward to welcoming all this progress and the projected $40 billion it will add to the economy. The title is no shock to anyone who follows the medical marijuana industry at all. 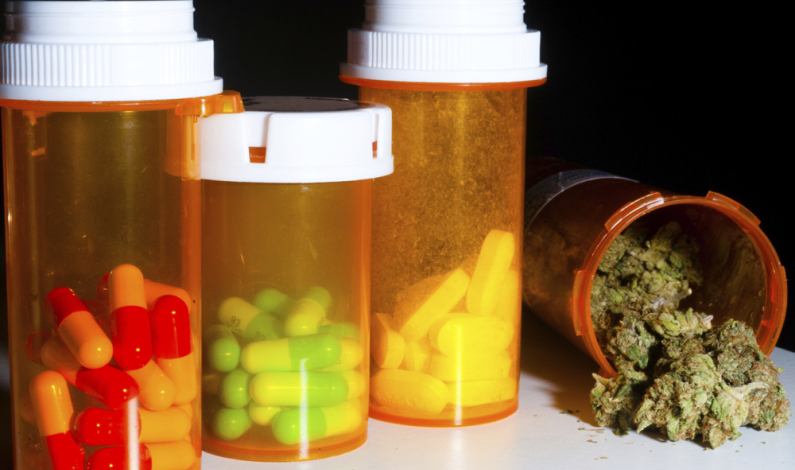 Prescription drug use in America is at an all time high, but states that have approved medical marijuana as an alternative to opioids have a 25% reduction in overdose deaths. This is partially due to patients that are experiencing chronic pain can substitute or supplement marijuana for their pain pills and are able to take smaller (or no) doses of the pills and are less likely to experience an overdose. Since there has; as far as we know no known overdoes on marijuana it suggests the substitution is the most likely reason for the reduction in deaths. As always though there are skeptics. Dr. Andrew Kolodny, chief medical officer at Phoenix House believes this has less to do with cannabis as a substitute for prescription pain pills and more to do with a proactive approach to treatment of addiction. This theory though doesn’t hold much weight as opiate pain pills are the drug of choice for the 21st century and these painkillers are tearing apart the fabric of American society. More people are addicted to these pills than to cocaine, heroin and crystal meth combined, and they’re second only to traffic accidents as the leading cause of accidental death. As more and more states warm up to the idea of marijuana as a medical (or recreational) drug with huge health benefits, the more it will enable the study of it’s medicinal qualities. If any case cannabis looks to be a better option than pain pills. Could Cannabis Become California’s Next Big Ag Crop? California currently produces more food than any other state in the country. What if legally cultivated cannabis was one of those crops? The possibility has many farmers seriously considering adding it to their list of crops. At today’s market price 1 acre could potentially net a farmer $19 million; albeit that price would drop considerably if enough supply came onto the market. Even then though the crop is far more lucrative than the usual tomatoes, cotton, corn, etc. This whole concept hinges on the states upcoming vote on November 8th, on Initiative #15-0103 to legalize marijuana and hemp under state law. This initiative would enact a sales tax of 15% and a cultivation tax of $9.25 per ounce for flowers and $2.75 per ounce for leaves, with exceptions for qualifying medical marijuana sales and cultivation. The initiative does however have measures in place to keep big Ag out of the market for the first 5 years. 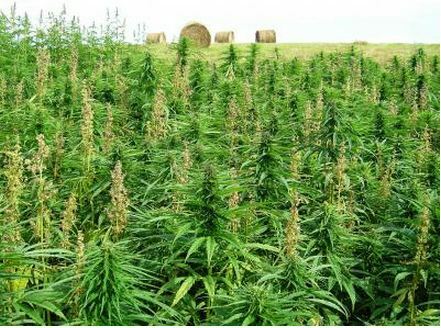 This is to protect the little guy for now, but there is one role big farms can play: growing hemp, which has lower THC levels and can be used to make paper, cloth and soap. Although there have been a number of proposed initiates in the past this one seems to have the right things and people behind it to make it all the way to the ballot box. It’s already received backing from former Facebook president Sean Parker, the Drug Policy Action and NORML. With the state legal cannabis industry topping $5 billion in 2015 and growing there’s a number of non-cannabis smoking, non weed aficionados from Wall Street getting into the game in a big way. According to a report from ArcView Market Research and New Frontier, if every state had legal marijuana the industry would be worth $36 billion annually. Guys like Steve Janjic, a former foreign-exchange executive at Tullett Prebon LLC is one of ex Wall Street guys and he’s now the CEO of Amercanex Corp, one of the countries only electronic cannabis trading platforms along side Cannabis Commodities Exchange or CCE. While Amercanex wasn’t the first, they have built a pretty heavy weight board of directors, showcasing the long term sentiment of the industry. Co-founder Richard Schaeffer, a former chairman of the New York Mercantile Exchange and now chairman of Amercanex is one of them. Others from the financial world involved include former Nymex board member David Greenberg, futures trader Timothy Petrone, a member of Nymex and the Chicago Board of Trade and James McNally, who’s been a member of Nymex, the Commodities Exchange and the Hong Kong Futures Exchange. All of these very well versed business people have the view that we’re in a pioneering time, in a pioneering industry that’s transitioning to an accepted legitimate commodity. As with any traded commodity there has to be standardized specifications and regulatory oversight to ensure that buyers are indeed getting what sellers are claiming. 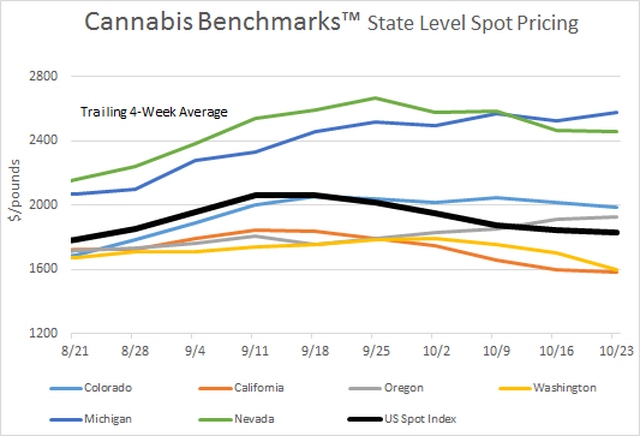 Since cannabis comes in a very wide range of quality, potency and prices, Amercanex sends what’s sold on its platform to a laboratory for evaluation and shares the results so buyers aren’t operating blind. Currently exchanges only operate within each state, so as not to violate any U.S Federal Laws, but you can rest assured that when cannabis becomes a federally regulated and controlled substance companies such as Amercanex and CCE will be well poised to reap substantial benefits. Cannabis infused honey is usually made in the kitchen, but now there’s a new way to make the sweet treat directly from a beehive. Some expert trainers around the world are now using their bee-training skills and passion for marijuana and its medicinal properties. They have now created a technique that allows bees to collect resin from cannabis plants and then use it in the beehive where it is naturally processed into honey. So far one bee trainer has successfully produced marijuana-infused honey using specifically the California Orange strain. 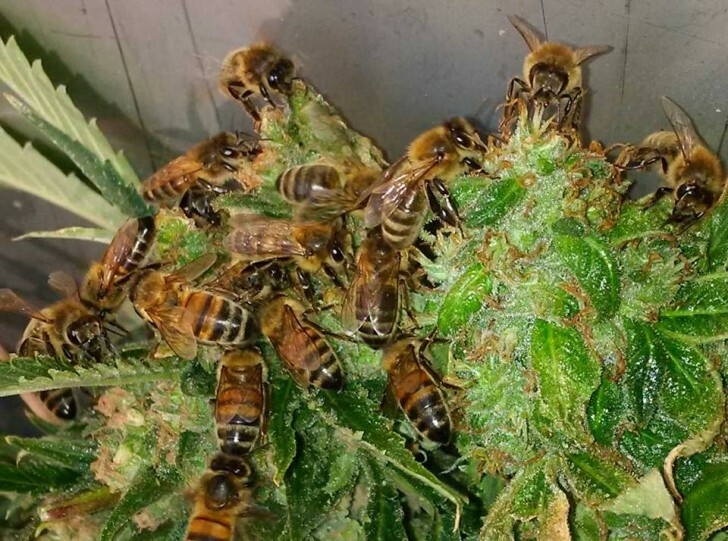 The bees seems to take any type of cannabis strain given to them and generate the same type of honey every time. Should the extraction method catch on, marijuana beekeepers could eventually produce a wide variety of canna-honey with a wide variety of effects and medicinal benefits. People that have tried the tasty treat have described natural canna-honey as sweet and delicious with traces of the actual plant. The final product is a thick, paste-like consistency that varies from light green to white or yellow. Before you try though, the honey cannot be smoked and can only be ingested. Should states be able to file law suits against another state based on individual state laws? On Monday, March 7th the U.S. Supreme Court was supposed to make a decision if it would even hear a lawsuit brought against Colorado by neighboring Nebraska and Oklahoma over marijuana legalization. 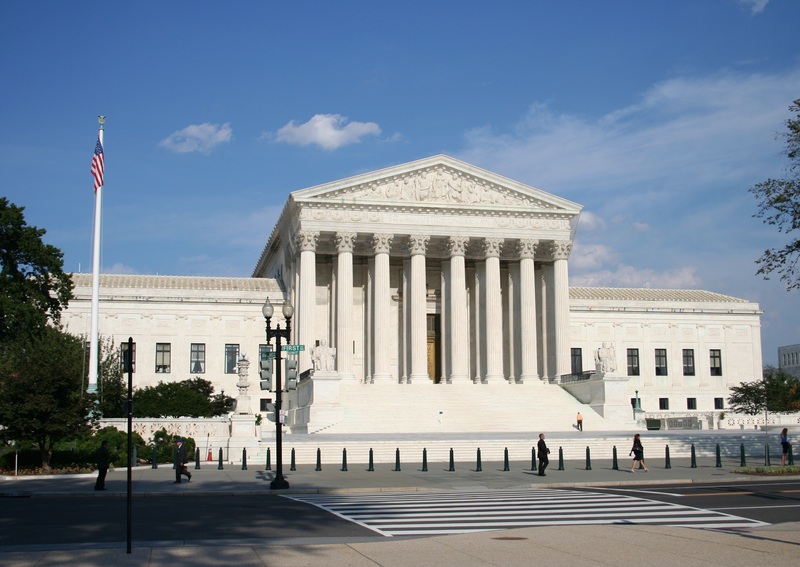 Because the lawsuit involves a dispute between states, it was filed directly to the Supreme Court and the first step in the lawsuit is for the justices to decide whether they even want to consider the suit, but even the U.S. government has taken Colorado’s side in this dispute and is urging the Supreme Court to not hear a major challenge to the state’s recreational cannabis laws. With the now late Justice Antonin Scalia, there’s a high probability that the Supreme Court may not make a decision on such a high-profile case while operating with only eight justices. This bodes well for Colorado as the case may not make the docket until another justice is appointed or may simply get dismissed as the remaining eight justices choose not to consider it. March 25 of last year the Securities and Exchange Commission announced that it had adopted the final Regulation A+ rules, enabling private companies qualified by the SEC to offer and sell up to $20 million worth of securities under Tier 1 requirements, and up to $50 million under Tier 2 requirements, to both accredited and non-accredited investors. Almost a year after this announcement, on Feb. 25, 2016, the SEC’s Advisory Committee on Small and Emerging Companies met to discuss the ongoing evolution of this new capital landscape. Since then more than 60 offerings have been made, which 19 have qualified, as of Feb. 15, 2016 with $1.3 billion in total capital has being sought under Regulation A+, with $290 million currently qualified. The $290 million in qualified filings represent a diverse group of capital-seeking companies, from an automaker and dental device manufacturer to a high-tech aviation company and a multi-divisional cannabis company, among others. With Regulation A+ allowing the general public to buy shares from qualified companies there is now an opportunity on the horizon for other entrants to continue blazing a trail that other capital-seeking cannabis companies should study. Is weed pairing the next big thing? It seems that pairing cannabis with food is quickly becoming and new culinary trend. Everyone seems to know a lot about wine pairing dinners. Wine pairing has been popular for so long, it’s now passé. Given the current trend towards marijuana legalization, many people are now treating cannabis like wine and high-end cannabis food pairing events are starting to pop up like mushrooms in February. 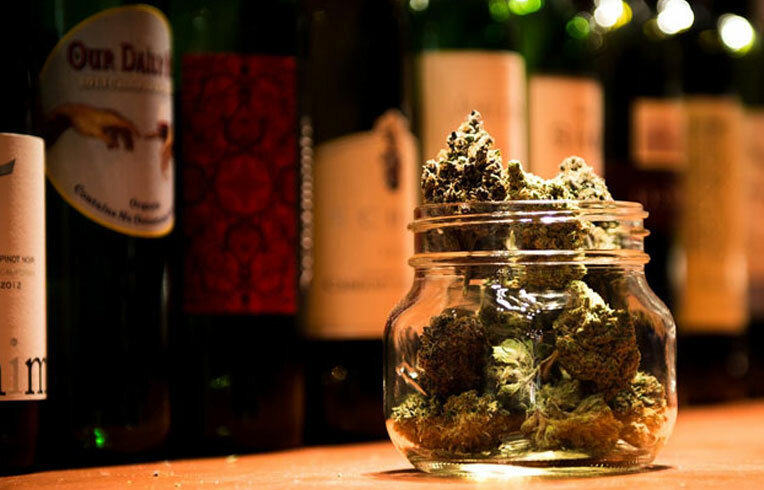 According to Philip Wolf, a pairing experience expert, “Cannabis should be treated like fine wine. It harmonizes so well with food when you have the right pairings.” Gone are the days of stoner food and in is the convergence of sophisticated chefs, growers and collective owners throwing elaborate culinary fetes in intimate settings. Sounds like fun, right? As cannabis and food pairings are still on the fringe of what some may consider ‘publicly acceptable’, finding or being invited to them isn’t quite as easy as finding a nice wine dinner at your local restaurant. But if you can get to one cannabis pairing events, hosts and growers are now using these as an opportunity to offer innovative and educational events for the community and allow them to, on a more personal level, go into further detail regarding each flower’s profile. As mainstream acceptance for cannabis culture grows these events are sure to become more and more popular. For more information on these and other events just leave us a message.